After all the hype about the new Loblaws on Carlton I had to pay a visit to the mighty “cheese wall”. Although they were not selling anything I haven’t seen before, I must say the display case was something else. It definitely made me want to buy a lot of cheese just so I could open the “vault” doors and reach in for a wedge. 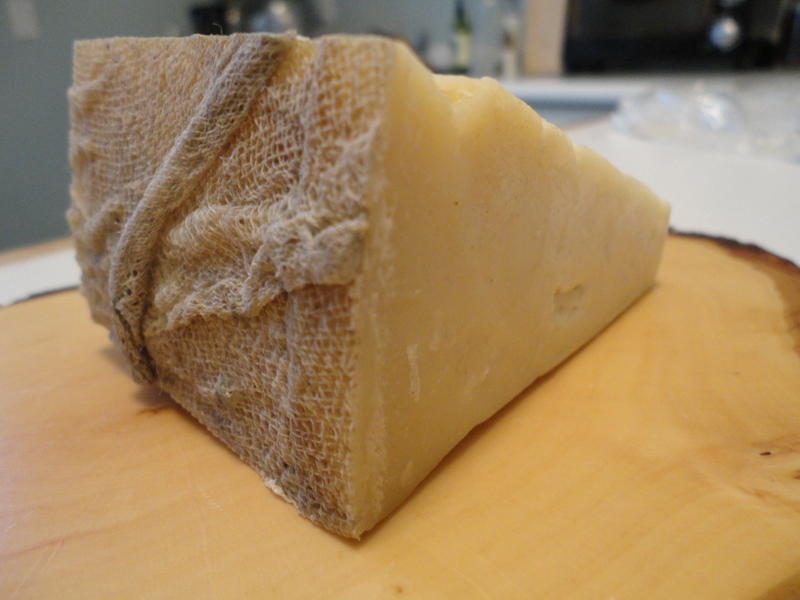 The wedge I decided to try was the award winning Lindsay Bandaged Goat Cheddar. Wrapped in cloth resembling a mummy, this goat cheese was a hit in my house. The rich, soft paste coats the mouth and was well balanced between salty and sweet. It starts with a typical goat cheddar flavour but after it melts in the mouth, I could taste bananas and floral violet notes. The texture of the paste with its small grainy crystals throughout was complex and interesting. Mariposa Dairy is located in the Kawartha’s. Apparently, they are expanding their facilities after this cheese won second place for “Best in Show” at the 2011 Amercian Cheese Society Conference.